The President’s budget requests $18.7 billion for NASA. The last administration’s FY 2009 request was $17.6 billion. The summary includes $7 billion for the National Science Foundation (NSF). The summary also highlights the important work done at National Oceanic and Atmospheric Administration (NOAA), including $1.3 billion to fund development and acquisition of satellites and climate sensors. Additional funding will be provided for climate and ocean research, including research to understand and monitor ocean acidification. Ocean acidification is an effect of excess carbon dioxide (CO2) in the atmosphere. CO2 is absorbed by the ocean, which lowers the pH. Ocean acidification reduces the ability of shellfish and corals to form their shells and skeletons and impacts the health and survival of other organisms that are part of the food chain. Improves Weather forecasting, Climate Monitoring, Fisheries Management and Ocean Programs. The Budget helps ensure continuity of National Oceanic and Atmospheric Administration (NOAA) satellite coverage needed for weather forecasting and climate data records by providing over $1.3 billion to fund the development and acquisition of vital weather satellites and climate sensors. Funding is also provided to advance climate and ocean research, including efforts to understand and monitor ocean acidification. In addition, the Budget fully supports implementation of the Magnuson-Stevens Act and its requirement to eliminate overfishing by 2011. All of these activities build upon the recently enacted recovery Act, which provides $600 million for the construction and maintenance of NOAA research facilities, vessels, and satellites, as well as $230 million for habitat restoration, hydrographic services, research, and management operations. Tip of the wind vane to Sustainablog. A report released today based on International Polar Year research in 2007-8 confirms that ice is declining in both the Arctic and Antarctic regions. Although it was previously assumed that Antarctic melting was confined to the Antarctic Peninsula, the part that extends northward toward South America, new data indicates that it "also extends all the way down to what is called west Antarctica." Colin Summerhayes, executive director of the Britain-based Scientific Committee on Antarctic Research, told the Associated Press, "That's unusual and unexpected." ("Antarctic glaciers melting faster than thought") The Pine Island Glacier in West Antarctica is moving toward the ocean 40% faster than in the 1970s, and the Smith Glacier is moving 83% faster than in 1992. 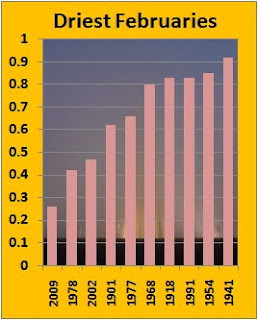 Image (click to enlarge): Excess number of melt days in Greenland during 2008 vs. 1979-2007 average. Red areas in the north indicate record-breaking melting in the range of 10-20 excess days. 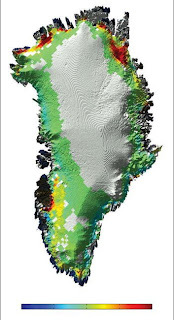 From Tedesco, M., X. Fettweis, M. Van Den Broeke, R. Van De Wal and P. Smeets, 2008: Extreme snowmelt in northern Greenland during summer 2008. Eos, 89(41): 391, 7 October 2008, via International Council for Science/World Meteorological Organization Joint Committee for the International Polar Year 2007–2008. Here's another spring forecast, this one issued today by the Met Office for the UK and western Europe. For the UK and western Europe spring this year is likely to be cooler than last year, with mean temperatures either near or below average. In contrast, mean temperatures are likely to be near average or above average over much of eastern Europe. For the UK and much of northern Europe precipitation is likely to be average or below average. In contrast, average or above-average rainfall is likely over southern Europe and the central Mediterranean. UK average temperature March–May from 1971–2000 is 7.4°C. Average precipitation is 231.7 mm. The spring forecast will be updated on March 25, and the first summer outlook will be issued on March 31. The Met Office also announced today that provisional figures show this to be the coldest UK winter since 1995/96. The federal budget is not the only thing showing large deficits in the Nation's Capital recently. Although the latest model runs have decreased the chances of breaking the February minimum precipitation record for Washington, the region from central Maryland southward through Virginia is running abnormally dry (D0 on the 5-level drought scale) in the longer term. 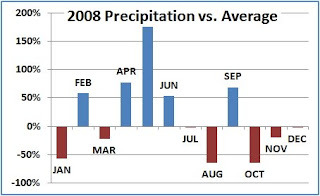 Especially compared to 2007, 2008 was quite wet (18% above average overall), but that was almost completely accounted for by a near-record May. Except for September, the entire second half of the year was dry, and last month was also slightly in deficit. Last year also showed wide variation in precipitation amounts; 8 months were at least 50% above or below average, including February, which was nearly the opposite of this month. Coleman paints such an elaborate, conspiracy-soaked portrait of climate change that it reads like a leftover subplot from The X-Files. He’s becoming less authoritative and more rhetorical. By calling global warming "the greatest scam in history," he opens himself up to criticism that his article offers no defense against. Coleman comes across as a man who’s so desperate to keep his hat in the ring that he’s taken criticism to an almost absurd level. Coleman has been an active resident of the deniosphere for quite some time. He's probably still ticked off that he had to slink away with 2 Hamiltons ($20 US for those across the pond) from what turned out to eventually fetch 5 Super-Large. This seems to be a common affliction of TV weather guys, including his former Weather Channel buddy D'Aleo at the cold weather blog IceCrap, where the forecast is always numb and number. For another example, see this gibberish at Revkin's place. (WMAR is a TV station in Baltimore.) You should have seen what this clown wrote before he discovered spell check. When I tried to engage in conversation about global warming with a Rochester, NY, TV guy at a local weather conference a few years ago, he started babbling about George Soros and refused to speak to me for the rest of the day. There are a few notable exceptions, but scientific competency frequently seems to be inconsistent with the ability to appear pretty on the toob. With the paltry 0.03" of rain and snow showers which fell at National Airport this morning, February's total to date is a mere 0.26". Since only a 50% chance of showers is forecast on Friday, there's a good shot at breaking the record for driest February since records began in 1871. If no further precipitation falls this month, the new record will also be drier than that of any other calendar month except March, April, September, October, and December. The last time so little precipitation fell in Washington was when a new record of 0.05" was set in March, 2006.